In Thailand, tom kha gai is eaten more like a curry instead of a soup, paired with a plate of rice and spooned onto your rice before eating it. 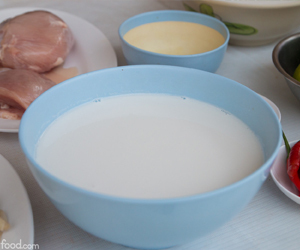 In this blog post I’m going to share with you a step by step tom kha gai recipe, the way you will find it in Thailand. The ingredients for this tom kha gai recipe are quite simple, but it’s the method of preparation, especially for the coconut milk that is the important part. Galangal is one of the most important ingredients in any tom kha gai recipe. The kha in the name of the dish in Thai, actually means galangal – so it’s very important, and there’s really no substitute for the galangal. It has an earthy spice flavor, and many people compare the taste to ginger, however it’s actually quite different in taste and feel. Galangal is included in many Thai curries and soups, and when used in small quantities, it provides a subtle kick of flavor. When you cook with galangal, you don’t normally eat the actual pieces of galangal, but instead it’s boiled in the soup to releases its wonderful essence of flavor, and then you either throw it away before eating, or leave it on the bottom of the bowl of soup. The base of any tom kha gai is coconut milk (น้ำกะทิ kati), and you couldn’t make this amazing Thai soup without it. Since I made this recipe in Thailand, I was able to use freshly squeezed coconut milk. If you have an opportunity to use fresh coconut milk, the flavor will be by far the best. However, if you can only get cans or boxes of coconut milk, this recipe will still work well. My preferred coconut milk is Aroy-d in the box, not the can. I’ve found it to have the best flavor and be the most similar to fresh coconut milk. 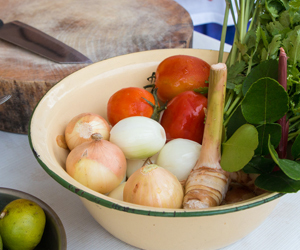 Another key ingredient for making this tom kha gai recipe are kaffir lime leaves (bai makrut). Finally, to give your tom kha gai a sour component, lime juice (manao) is the beautiful final fresh touch to this recipe. Little Thai limes or key limes are typical for this tom kha gai.